Today’s WINNING recipe to meet Coach JC’s 10 WINNING Habits is Smothered Meatballs & Marinara. Where is my lean protein? 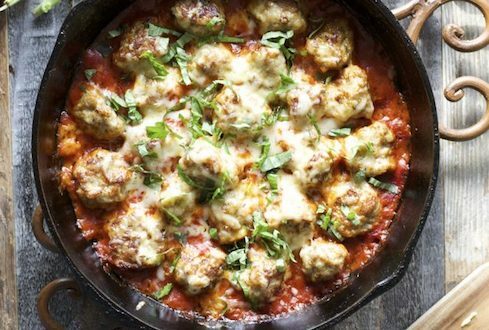 To make meatballs, combine all of the ingredients above except for the olive oil and basil. Roll into small balls and set aside. Heat a large cast-iron skillet to medium-low heat, and add a teaspoon of olive oil, or spray with cooking spray. Place the meatballs in the skillet (this may take 2 batches) and cook until browned on all sides, turning occasionally. This will take about 4 minutes per batch. Remove the meatballs from the skillet and place on paper towels to drain the grease. Add the marinara to the cast iron skillet, place the meatballs back in the skillet, and top with the shredded cheese. Bake for 30 minutes at 375 degrees F. Top with basil.